Here we go with Round 5 of the Character Codex! This will finish off the dwarves. If you've missed any, check out the Character Codex Gallery. Next week we will start with a female Elf Barbarian and a Male Elf Bard. 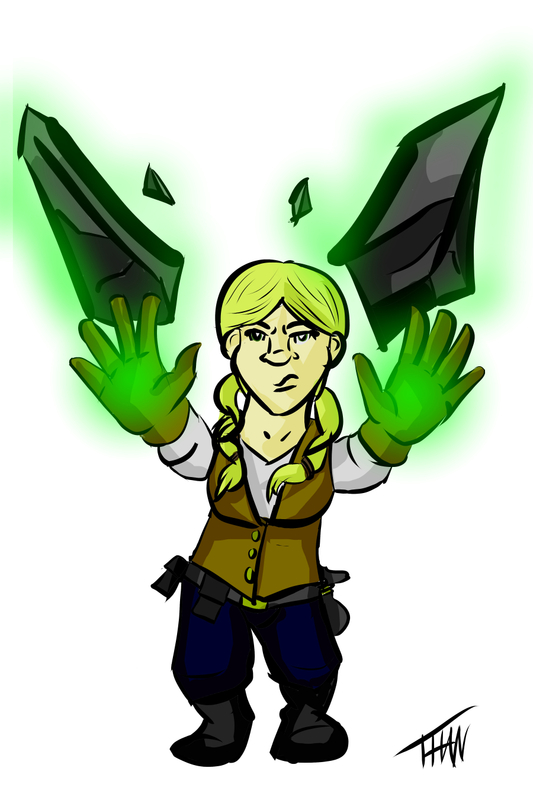 Speaking of elves, make sure to check out the latest comic where we introduce Elysia, our first elf character. Also, make sure to have a look at the World of Chronicle entry for the Celesyn, or high elves of Chronicle. Next week's entry will be for the Saesyn, or wild elves. Also in the World of Chronicle section, you will see our Virtual Tabletop Token Gallery. This week all 11 dwarf classes are in there. Next week, we'll rotate out and start adding in the elves. Finally, come back tomorrow for a new strip as we begin to investigate exactly what happened in Autumn's encounter with the Slumripper. For the Dwarf Wizard, I wanted to still show that no-nonsense style of the dwarves, but I also wanted to give this guy some power. He's a high-level guy but he keeps his robes fairly modest, save for all the enchantments! This is our first look at the wizards of Chronicle. We'll be exploring a lot more of the Brotherhood of the Threefold Path, the organization most wizards in Chronicle belong to, later. For now, this wizard is a member of the Grey Order, an order within the Brotherhood dedicated to magical research and observation. First up is the dwarf sorcerer. I wanted to show a distinction here between sorcerers and wizards. Sorcerers in Chronicle can be anybody. You don't have to be of a special family, have great wealth, or be well-educated. Literally anybody can be born with the talent to tap into the natural energies of magic. I wanted to draw her as being "down to earth" and what better way in work clothes and moving earth. The dwarves of Jaxstein use magic like this to carve out the terraces they use for farming in the mountain valleys. This dwarf may just be one of those terraformers. So, there you have it! 11 dwarves down, 66 adventurers to go. See you next week with the elves! Here's what's happening this week at Chronicle! There was a problem with the submission form last week that resulted in entrant data being lost. If you entered the contest, please resubmit your entry HERE. Because of this, the deadline has been pushed back to 11:59 CST tonight. So you have one more day to name those rogues for a chance to win a free full-color commissioned character drawing of your choice. Keep in mind that the character doesn't have to be fantasy based. I will draw any character or person you want - superheroes, sci-fi, cartoons, historical figures, a caricature of you, whatever you want. This week in The World of Chronicle we'll start to delve into the elves of Chronicle. Part 1 will explore the Celesyn, or high elves, of Chronicle. This week, the dwarves of the Character Codex will be finishing up. A female sorcerer and a male wizard will round us out. Virtual Tabletop tokens will go up for them the same day. The dwarf tokens will stay up for a week and then the whole set will come down when the elves go up. A downloadable pack of all 11 dwarves will follow shortly after. In the Comic this week, Autumn and Elysia discuss the encounter with the Slumripper. People seemed to like the Nausicaa drawing from last week. Let's see where my brain will wander this week! As always, please share, re-tweet, and like on your social media site of choice. Feel free to leave a comment to let me know how I'm doing. If you like what I'm doing please consider buying a commission, leaving a tip, or clicking an ad. Welcome to Round 4 of the Character Codex! If you're new here, the idea is simple: I'm going to illustrate all 77 race/class combinations from the Pathfinder Roleplaying Game Core Rulebook. These are also the "traditional" races and classes you'll find in Dungeons & Dragons. You can see everything so far in the Character Codex Gallery. Before we get to the characters this week, I want to mention a couple of things we have going on here at Chronicle. First, in conjunction with the Character Codex, there are now Virtual Tabletop Tokens of each of the Character Codex characters available for free download and use on Roll20 or any other virtual tabletop program. Second, if you like the artwork you see here each week, you should enter the Name That Rogue contest! It's a chance to have a FREE full-color character drawing done by your request. So far, no one has named all 25 characters, so the chances are still good! Lastly, don't forget to come back tomorrow for the latest Chronicle strip. We introduce a new character in this week's strip! Now on to the characters! The first character this week is the female Dwarf Ranger. She's an all-around explorer. Many of the rangers in Chronicle tend to wander the mountain valleys around Jaxstein, the great dwarven vale. This is reflected in her climbing gear, but she's got a wanderer's spirit and is willing to go wherever she needs to go. Note the wrench built into the pommel of his shortsword. I imagine that as a shortsword that gives +2 to Disable Device or Profession (Engineering) checks. Oh and, yeah, the scabbard and strap are made of duct tape. As always, if you like what you see here, Like, Share and Re-Tweet on social media. Or, even better, click an ad, leave a tip, or buy a commission! Welcome to Round 3 of the Chronicle Character Codex! We're still making our way through all 77 race/class combinations in the Pathfinder Core Rulebook. If you've missed any of them check out the full gallery. As always, two quick things before we start. First, check out the Chronicle comic! It updates every Thursday, so come back tomorrow for a new strip! This week's is a lot of fun with 25 characters in it! So come back and take a look. Also, if you like what you see and you want your own character drawn, I'm running a sale on Character Sketches. I also draw other characters besides fantasy, so if you've got a superhero, sci-fi adventurer, supernatural detective, or anything else, I'll be glad to draw it too. Now on to the Codex! First up is the Dwarf Fighter. This guy is an update of a character from the original Chronicle comic book from back in the day. He has the fantastic name, Thorak Doomhammer and is a loyal companion (if the gold is good!) The original Thorak didn't actually have armor in his design so I added in the chain shirt and greaves to bump up his AC. Finally, we have the Dwarf Paladin. In Chronicle, the majority of dwarves have given up their warrior ways, choosing labor and craftsmanship over combat. Their god, Jax, blesses this craftsmanship but seeks only true warriors to be his paladins. 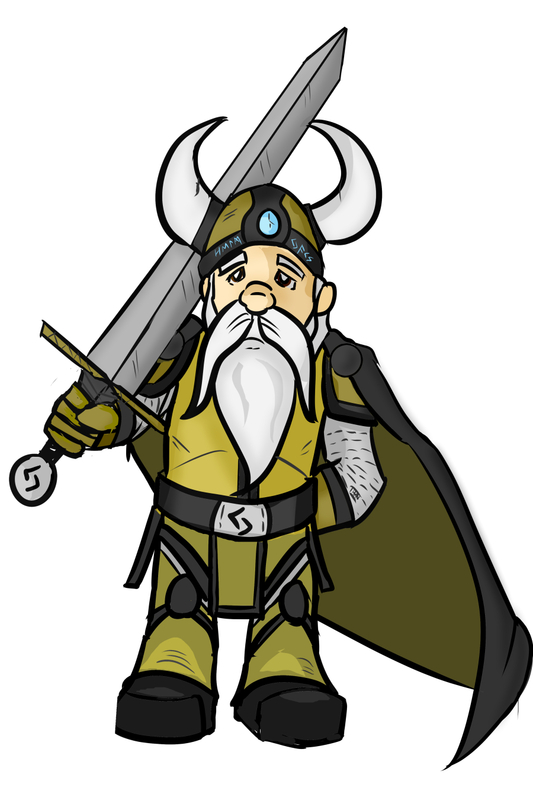 This older dwarf is one of the select few and has seen many battles before being honored as a Paladin. The symbol on his sword's pommel and his belt buckle is the rune for the letter J, for Jax. His armor's (along with the Dwarf Cleric's armor's) colors (gold and black) are Jax's colors as well. 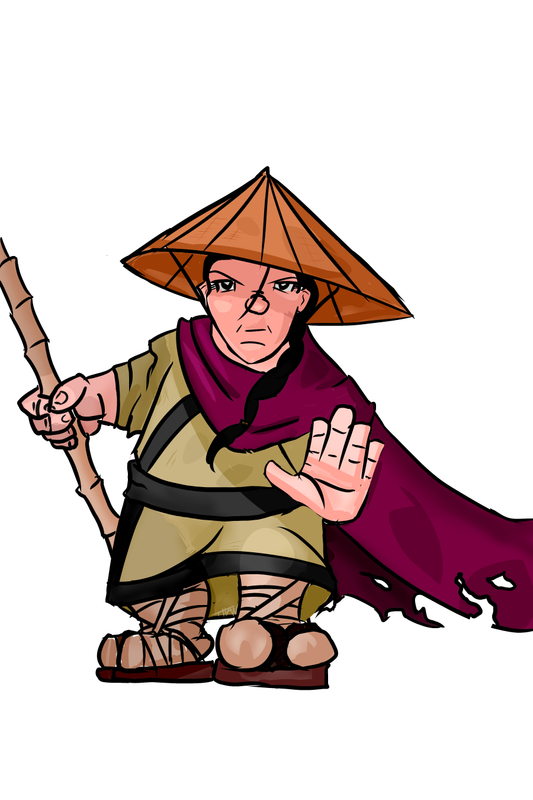 Next up is the Dwarf Monk. I'm super pleased with how she turned out considering I had a hard time deciding what an eastern style, female dwarf would look like. Sporting a straw hat, simple kimono-style robes, and a the two-toed sandal, she bears the simplicity of a follower of Vrae, the Chronicle god of Truth, Wisdom, and Discipline. That's it for this week! Next week, we head into mountains and the cities with the Dwarf Ranger and Dwarf Rogue. If you enjoyed this, please Like, Share, Retweet this page on the social media site of your choice. Here's the latest update to my Character Codex project! In case you missed the first update (gallery here), I'm going to be going through all 77 race/class combinations in the Pathfinder Core Rulebook. Before we get started, let me ask you to go check out the Chronicle comic! Even though I'm having fun with the Codex the comic is my main focus. It updates every Thursday, so come back tomorrow for a new strip! Also, if you like what you see and you want your own character drawn, I'm running a sale on Character Sketches. Okay, enough promotion! So, today we have the Dwarf Cleric and Dwarf Druid! 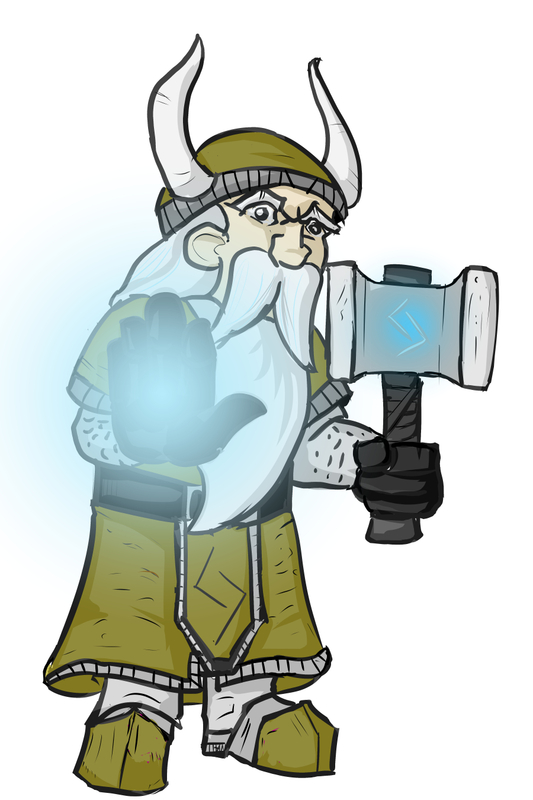 For the Dwarf Cleric, I went pretty traditional; armor, hammer, beard. I imagined him as being a lower level character, so not much in the way of gear. He's a priest of Jax, the dwarven god in Chronicle. Rather than have a separate holy symbol, Jax's priests use their weapon which has been blessed. Here he's turning some unknown undead. It's a bit rough and a little plain, but I'm still pleased with it. For the Dwarf Druid, I went a little out of the ordinary. First off, yes, that is indeed a bearded female dwarf. The bearded women thing with dwarves has always been a bit of a controversy. Some say it's just a joke and they don't actually have beards, some say it's mandatory. Pathfinder's (and D&D's, if I recall) official stance is that they do not, in fact, have beards. The official Chronicle stance is that they once had beards, but after the dwarf nation traded its swords for plowshares, the hirsute look fell out of fashion. Now only, the most uncivilized dwarven women have beards. I figured a druid would fit in that category. She's a mountain druid and fairly high level, pulling off some earth bending moves. I'm super pleased with this one. The spearhead looks rough, I may go back and correct that. But, I'm happy with everything else. Next week, is the Dwarf Fighter and Dwarf Monk (and Dwarf Paladin, if I get time)!